We took the day off today to allow for travel time to a Recognition Dinner event this evening. We were busy as bees this morning with office work –sad, really, it was a beautiful morning– but relaxed a little more this afternoon. I decided to attempt some photos of a foliage plant, a “volunteer” of unknown species, that has been thriving at our back door. Those photos had mixed success. 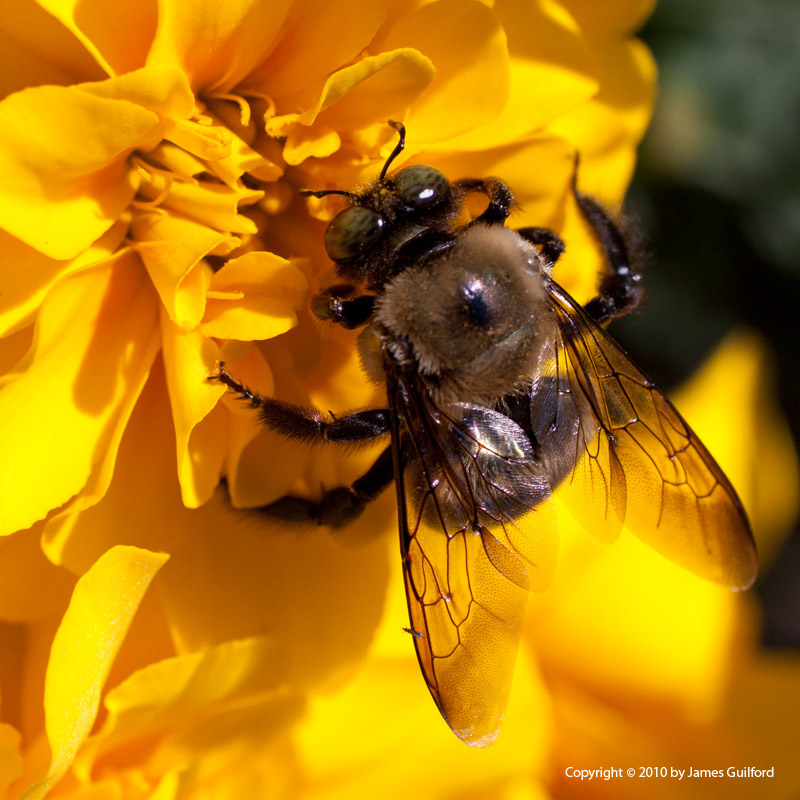 As I was about to pick up my tripod and head back indoors, I turned and noticed a couple of very large bees giving our bright yellow marigolds a going over. What the heck… I’ve got the camera with me, complete with macro lens, and bright light to work with; let’s shoot some bees! 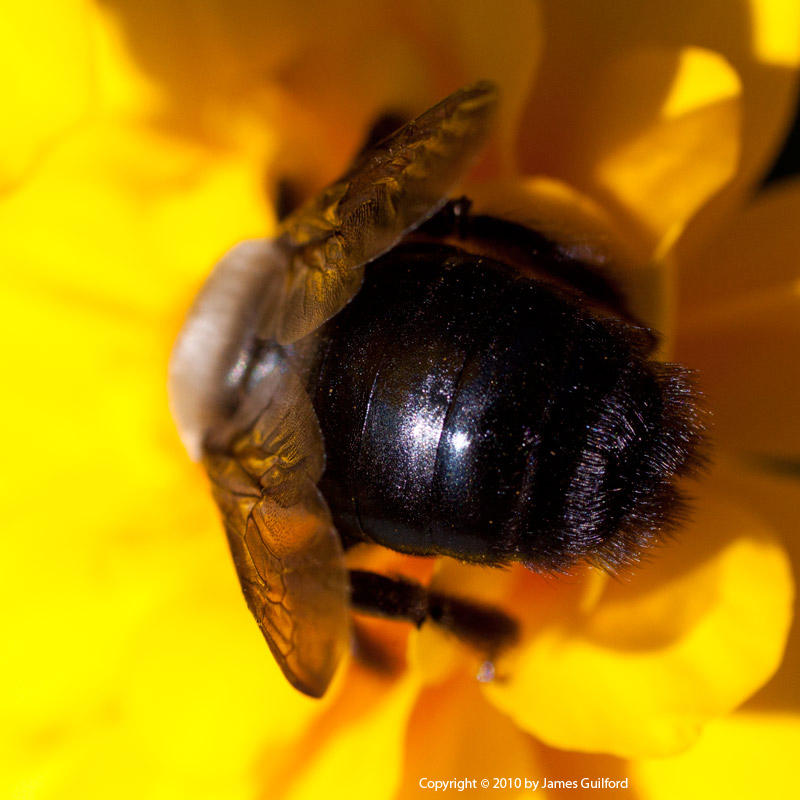 A bee works to extract nectar and pollen from a marigold bloom. I was pretty happy with the shots in general. The afternoon sunlight allowed for shutter speeds well over 1/1,000 second and that really helped when shooting handheld — bees and flowers move and focus shifts fast! Looking at the images on the computer screen I noticed details I hadn’t noticed before, especially in the bees’ wings. So I enlarged and cropped that area on one shot. I’m delighted. I could make that bee photo two feet wide and it would still look good. 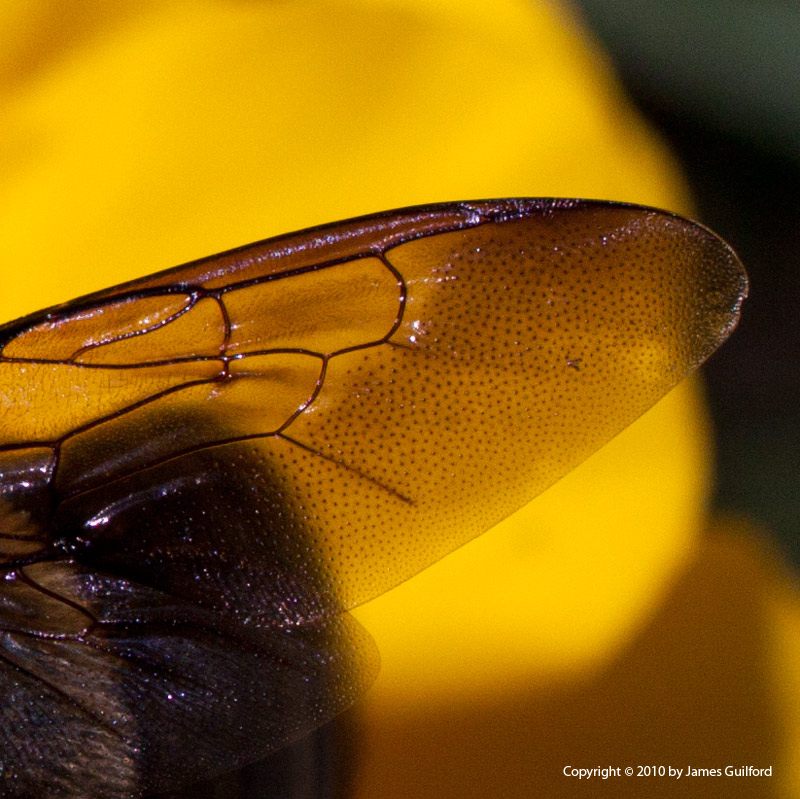 Cropped image showing details in bee's wing. I packed it in and said good afternoon to my buzzy little friends. Soon it will be time to get dressed and head out. I’m hoping for a nice evening. I’m also hoping my voice will hold out: I’ve had another bout of laryngitis and, though better today, my voice is still strained. FANTASTIC!! These pictures are incredible. You did a wonderful job getting such detail and very clear shots. They could be used in a textbook or in National Geographic. I’ve got to say I myself was surprised at the detail that was recorded! They were pretty much grab shots –I wish I’d have used a different setting– but I was delighted at what I saw anyway. The lens was a very good quality (though not premium) Canon 50mm macro lens. Thanks for the compliments! Awesome shots James. I also like the size you have presented them here. I don’t seem to be able to get mine “right” on the theme that I’ve chosen. If I select large they are ridiculously big and yet I’m not happy with the “medium” I am choosing. Perhaps when I get back to DC I will have more time to sit and fiddle around with WordPress. I backed up all my stuff onto TypePad as well because it would accept all my photos and they look much better over there… oh well, trial and error is good for the brain. WOWIE ZOWIE!! Those are Fantastic!!! that top one, is that a teeny bug on that bees lower wing? Incredible shots! These are absolutely gorgeous James! Just gorgeous!